This beautiful coffee table game comes packaged in an aged wooden book and is played upon a wonderfully illustrated cloth treasure map. Choose a ship, a port of call and set sail in search of treasure. Trade in a foreign port or sail broadside to another captain and take your best shot. Be the first pirate to collect all types of jewels and land on Dread Island to become the most feared and powerful captain on the high seas. 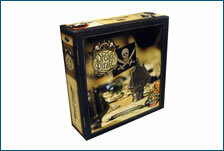 Journey back with your family for a high seas treasure hunting, pirate adventure!